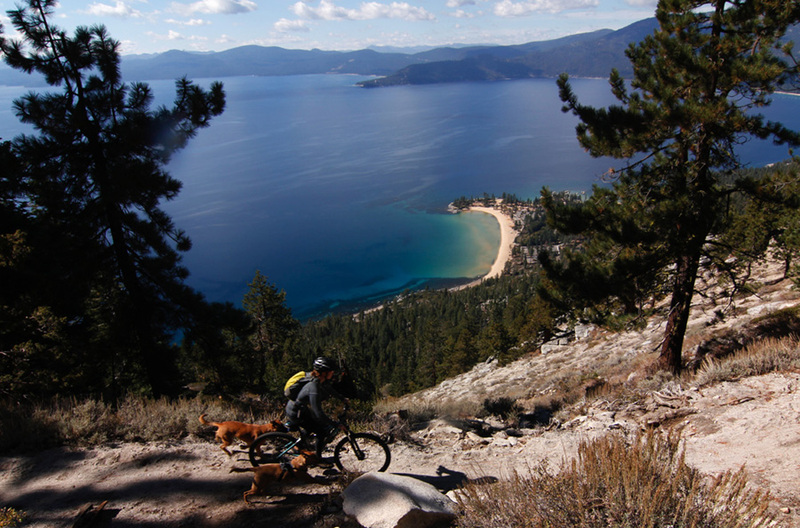 Lake Tahoe offers some of the most spectacular mountain biking trails you will find just about anywhere. There is something for everyone, too. The Flume Trail offers spectacular vistas with a not too difficult trail, or you can opt for the technical steep single track of Mr. Toad's Wild Ride or the Christmas Valley Downhill. Many of the rides listed below can be combined, or parts of them can be combined to come up with numerous options. These are but just a few of the many rides that Tahoe has to offer. If going up is not your cup, then both Northstar and Kirkwood offer lift accessed downhill runs. Get the best deals on bike parts at Competitive Cyclist! Flume Trail - Several options here including a commercial shuttle. Very scenic. Intermediate to expert choices abound. Christmas Valley Downhill - Includes beta on several detours to Scott's Lake, Round Lake, Dardanelles Lake and more. Intermediate to expert. Corral Loop - Intermediate loop rides with lots of options. Intermediate. Mr. Toad's Wild Ride - One of Lake Tahoe's most popular rides for a good reason. Shuttle it or ride it as a moderately long loop. Expert. The Bench - Beautiful ride along the Tahoe Rim Trail between Spooner Summit and Kingsbury. Great lake views. Intermediate to expert. Also includes info on the Chinese Downhill. Rim Trail - Big Meadow to Kingsbury - The highest mountain bike trail in the basin reaches an altitude of 9,700'. Intermediate to expert. Northstar - One of the top mountain bike parks in the country. Lots of terrain features. Excellent learning facilities. Kirkwood - This is more like lift assisted cross country than a downhill mountain. Very scenic with lots of wildflowers. Check out Lake Tahoe's cycling shops as well as more mountain biking links.